The basic plot line of Fitzgerald’s classic The Great Gatsby has become somewhat easier to follow after the recent adaptation by Baz Luhrmann that was seen by millions of people all over the world. At Anglozine, we typically prefer books over movies and we sincerely hope you actually read the book before seeing the movie. Nevertheless, we are always happy to see interesting visualisations of the classic fictional heroes, which is why we decided to share this interesting infographic with you. While the thoughts on Luhrmann’s adaptation range from despising the movie to praising his innovative techniques, we’re sure most of you would agree that this infographic is done just nicely. For those of you who read the book years ago, this can be an interesting reminder of the most important characters and scenes in the novel. 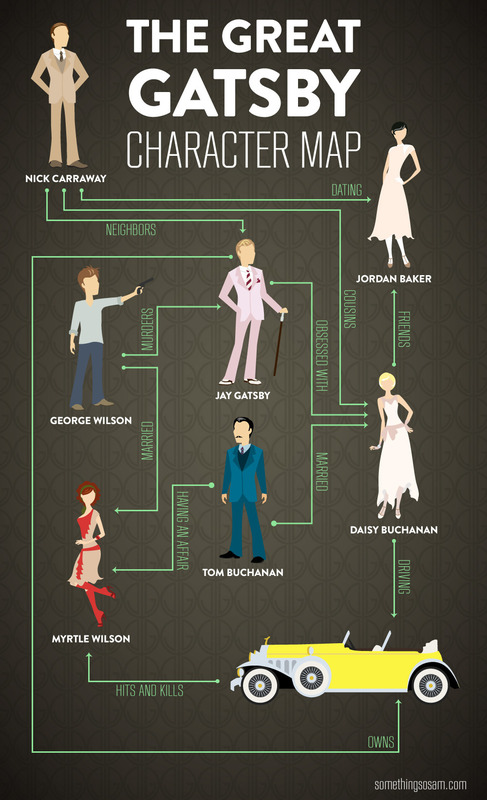 Originally created by SomethingSoSamp, this character map summarizes the key relationships between The Great Gatsby characters.